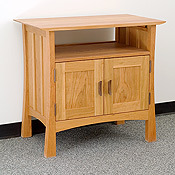 New England Wood Horizon entertainment stand for the the bedroom, office or living room. Available in solid cherry, maple and walnut. Vermont Furniture's versatile entertainment stand coordinates with any room décor whether you use it to hold your TV or to store away books and videos. Storage options include a TV area on top, digital media compartment below and 2 cabinet doors. Durable attractive designs and commitment and quality of construction allow these pieces to hold its value room after room, decade after decade. Choose a more traditional, elegant design with the Chatham style or accent your unique style with the more contemporary Weston style. Entertainment chests available in solid cherry, maple or walnut. Environmentally Friendly Hand-Rubbed Linseed Oil Finish boiled linseed oil thinned with odorless mineral spirits. While raw linseed oil is natural, the 'boiling' process requires the addition of small traces of chemical driers. However it is less toxic to you and the environment, as compared to other finishes such as lacquer, since the process produces no emissions to pollute the air. Vermont Furniture Designs elegant entertainment furniture sets are bench-crafted with the caring techniques of experienced craftsmen and the greatest attention to quality control. This begins with the careful selection of wood that matches in color and grain.